Voting is a protected human right under the Human Rights Act 2004. The ACT Electoral Commission (Elections ACT) is committed to providing services to help all eligible electors in the ACT to participate in the electoral process. The Disability Advisory Committee provides advice and feedback, based on the expert knowledge of its members, to assist Elections ACT in providing more accessible and inclusive services and resources for voters with disability. The aim is to make it easier for voters with disability to participate in the electoral process. The advisory committee meets annually. Additional meetings may be held in the lead up to and during the ACT Legislative Assembly election if required. Members are invited to join based on being representatives of organisations that are key stakeholders within the community of voters with disabilities and/or their ability to represent that community on a personal level through lived experience. There is no set term for membership. However, the membership list is reviewed every 2 years with the aim of achieving a membership that is genuinely representative of the community of voters with disabilities. 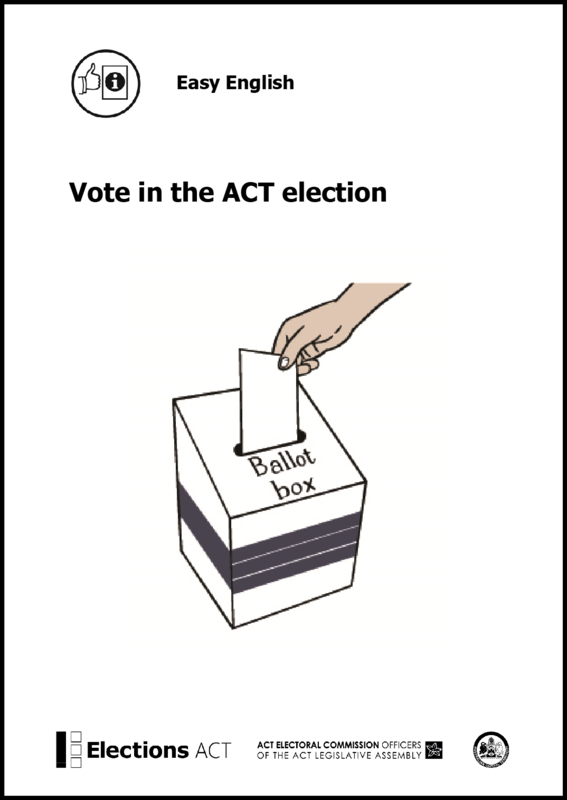 Elections ACT has produced an Easy English booklet titled Vote in the ACT election. This booklet is designed to help people who have difficulty reading and understanding English. It provides information about enrolment and voting in the ACT Legislative Assembly election. The guide is intended to help with making choices and actively participating in the electoral process. Reading an Easy English publication is a good shared activity between the reader and another person such as a friend, family member or support person. The support person can help the reader to understand by discussing the concepts in the book with the reader and providing further details in response to questions from the reader. The book can then become a helpful reminder for the reader later. Elections ACT has produced a fact sheet for carers and family members of a person with disability. It contains information for carers on how to help a person in their care to vote as well as information on the assistance available at election time. Information is also provided explaining what can be done if a person in their care is not able to sufficiently understand enrolment and voting.